Learn how to cook cereal prawns is definitely a plus point to save your bucks as having cereal prawns at the restaurants could cost you at least S$30 for the dish. However, if you cook this at home, it will simply shack off a $10 note from your wallet for the ingredients. Moreover, it’s easy to cook, and delicious to eat! There are many ways to cook cereal prawns. With or without eggs, with or without creamer, with premix or original plain cereal.. I used what I’ve gotten in my kitchen cabinet, the usual cereal drink comes in 3-in-1 sachets which I bought to make drink for the family in the mornings. Yeah, unless what you have is the original cereal in tin packaging, just mix your own non-dairy creamer and sugar moderately. Otherwise, use those you already have in your drinks pantry! Yes, I have 3-in-1 sachets (I bought NesVita 3in1 Low Fat cereal drink by Nestlé brand). I cooked this a few times, and tried to cook with and without egg. This recipe I am sharing now is the one without eggs. Hence, it looks less greasy as less butter was used. You might think it will be slightly less fragrant since those two main ‘fragrance contributors’, butter and eggs, were lessen or absent in the dish. However, I preferred this version as like what I said, it was much less oily! 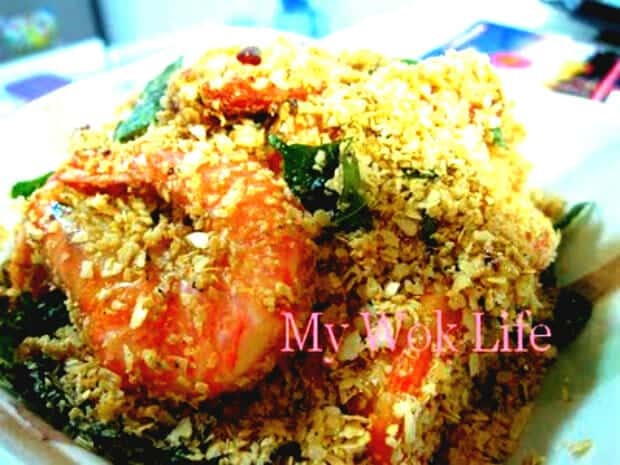 I loved this eggless Cereal Prawn, and still found it very fragrant with a hint of curry leave scent. * Mix all together, with salt and pepper. 1) Clean prawns with shell intact, trim legs. Use scissors to cut a slit at the back of prawns to devein. Pat dry the prawns with kitchen towel. Season prawns and leave aside for 10 minutes. You may leave it in the refrigerator. 2) Heat wok with oil over high heat. Add some salt into the oil. Make sure oil is heated till really hot before deep frying prawns for 1 minute or until pinked and crisped (You may fry prawns in deep fryer, as desired). Drain on kitchen towel and set aside. 3) In a clean small bowl, pour out and place the sachets of cereal all into it. Mix in salt and pepper. Set aside. 4) Remove exessive oil from the wok and heat up with butter over medium-low heat. Brown garlic, and add in chilli padi and curry leaves, stir fry till fragrant (beware of pungent scent of chilli padi). When done, heat off and immediately add in cereal mixture and crisped prawns. Stir vigorously to combine well. Serve immediately. A portion of fried cereal prawns counts about 500 – 600kcal! Yes, without the egg even.. So, you have to really try to limit your intake with this sinful savoury, if you are watching out your weight or having relatively high cholesterol level in your body. Tips: If you are not confident to well mix the cereal and prawns quick enough upon heat off, you may choose to reduce heat to very low fire and do the mixing, just before heat off. * Deep fry the prawns till really crisped in extremely high flame, so that you may chomp the whole prawn with its crispy shell altogether. **Beware of splashing oil when frying. * Lightly coat the prawns with corn flour before deep frying for crispiness, if you intend to eat also the shell, optional. Otherwise, just fry prawns till cooked. This looks really delicous, we usually order this with the Chili crabs. any recipe for chili crabs? I’ve tried it.. But my cereal is not crispy like what we order outside.. Any tips on this? Add the cereal only when heat off. And do not put too much oil/ butter. You may also fried the cereal in a dried heated wok (without grease) beforehand. Then, set aside and return to the wok again at last step. Hello..I chanced upon your blog and I really find it so interesting and informative. I never knew cereal prawns were so easy to cook! The prepack seasoning for the prawns is almost $2+ so using 3 in 1 cereal is really a good way to make this! Thank you so much for sharing!!! This was incredible. Thanks for the recipe. I didn’t have curry leaves but it tasted great nonetheless. I used 8 bird eye chilis to spice things up. hey thanks for the recipe. turn out good except for the part the cereal did not stick to the prawn . haha any idea why? I think it’s usually not so sticky. Just little of the cereal may stick in fact. And I think it’s good enough in my dish when I cooked this. I am not sure if it’s helpful to drizzle some water to it but it may ended up soften the crisped cereal. Or, you have to deep fry the prawn and less drain it when return the prawns to wok. The remaining oil may help to stick with more cereal in that case. hi! interesting blog. I’m living in the states so when i get cravings for certain kinds of food, i will turn to the WWW. Hope u will be able to help me with this question: If i want to use eggs, when do i add in the eggs? Add the eggs only towards the end of your cooking. Dish up the cereal prawns first. Add in more oil, and then, break Teo eggs in the heated wok, let the eggs set for 3 seconds before scrambling it. 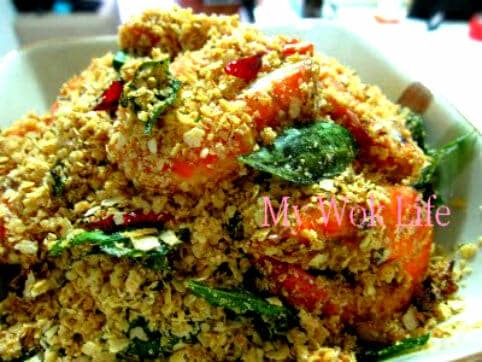 When it is half cooked, quickly return cereal prawns into the wok and mix well with the mashed egg pieces. I will show you the picture of my cooking for such in due. I intent to remove the shells from the prawns to make it easier for eating especially for the children. Do I follow the same methods as in marinating and deep frying?? Hi Anne! Sorry for my late response. To cook shelled prawns, there should be a little extra step on the prawns. Season prawns as usual. When ready to cook, dip the prawns in beaten egg yolk, and dust with corn flour and fry till lightly crispy. Drain and let the prawns cool. Repeat the frying part again for a few seconds after that. Then, follow the rest of the steps as per my recipe. I have try this a few time. This is a great recipe. My family loves it. Thank you for sharing. Yea, I cook this often, too. Glad you liked it, too.